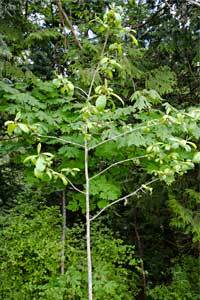 A tall deciduous shrub or small tree to 30′. Oval, pleated leaves with bold veins. Small yellow green flowers becoming edible blackish berries. Smooth, gray bark. Found in shady mixed woods. 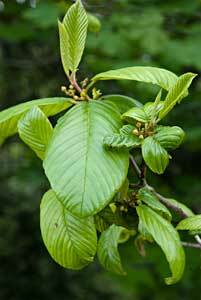 The bark is the source of Cascara sagrada, a well known laxative. Native to Southern B.C. to Oregon. Found in eastern Olympic Peninsula.